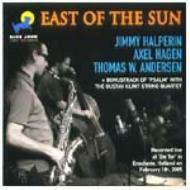 PLUS Bonus track of Jimmy Halperin’s composition "Psalm" with the Gustav Klimt String Quartet + Frank Timpe/ bass clarinet. Recorded live at Jazzcafé "de Tor" in Enschede, Holland on February 18th, 2005. 3 : Tifala Tu, Latifah II?